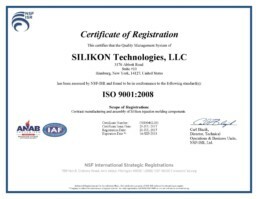 SILIKON Technologies has now achieved a QMS registered to ISO 13485 & ISO 9001! 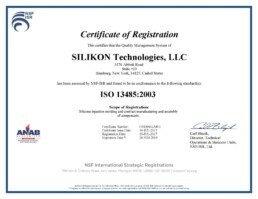 In July, SILIKON’s Quality Management System (QMS) had its final audit to ISO 13485:2003 standards for medical customers, as well as ISO9001:2008 for customers that do not require the more strict standards or cleanroom procedures. We hope that these registrations allow our current customers and potential clients to feel comfortable that SILIKON Tech. carries the same focus and passionate commitment to the high quality standards for *critical-to-life ® components and assemblies that our customers expect. Our Director of Silicone Technologies, Mr. Patrick Meheran, was instrumental in creating the QMS and worked tirelessly to ensure we covered all aspects of our high-quality services, processes and procedures for the NSF audit team and customers alike. Congratulations SILIKON Team….what a great accomplishment! We are very proud of your hard work & dedication to take us to the next level. If you’d like more information on reasons to use silicone in your applications, or on our Silicone Injection Molding capabilities at SILIKON visit: silikontechnologies.com and make sure to connect with us on LinkedIn for SILIKON’s latest updates and industry posts. If you missed Part 1 in the series we highly recommend you first go back to the June Newsletter to catch up on the starting details! So in Part 1, we gave you a quick foundation of Jack & Joan’s background, but let’s take a step backwards for a bit, as we skipped over some fun facts! While Jack & Joan were still in college and dating, Jack needed a way to pay for tuition so he put an ad in the local paper “Need Sump-Pump Fixed?” so that he could have an extra income to help pay bills. 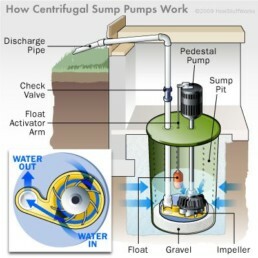 He was good at the hands-on mechanical stuff and in the Western New York area at the time, everyone always needed sump pumps to be fixed. But, here is where the magic started, and how the teamwork began:Jack taught Joan how to disassemble the sump-pumps and lay them out on the workbench so that they could be repaired and re-assembled in an efficient manner. Jack cleaned &fixed them, and then Joan invoiced the work, bringing the job full circle. 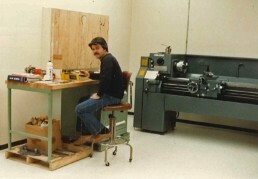 They didn’t know it at the time, but they had just started their own way of “lean manufacturing”for a small business unit! Later, after they married and while Jack was still working for Thruway Molders, Jack & Joan needed another extra source of income to be able to pay bills and start saving for the future, so Jack actually volunteered to bring extra work home that the company was desperate to catch up on, and they spent extra hours late at night in their basement sorting and hand painting plastic parts while the kids were sleeping. 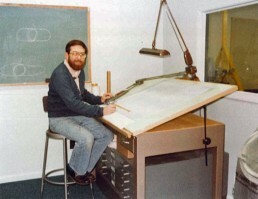 The company had a requirement for computer keys that were molded with the letters and numbers depressed into the key, and Jack and Joan flooded the top of the keys with paint, then wiped the surface clean so that only the depression remained colored. It was nights like that, spent working extra hours that they often toyed with the idea of running their own business so that things could be done more efficiently and be done right the first time. It was also about this time that Joan decided to go back for more education and take night classes held at a local high school, for bookkeeping and accounting. Once she had completed her course load, Jack was inspired to do the same and decided to go another couple of years to get a 4-year degree. He went to University at Buffalo (UB) and took business law, economics,etc; all the general courses required to get beyond the 2 year associates degree in mechanical technology that he already had from Erie Community College (ECC). After he finished his third year, a funny revelation happened one night while leaving classes to go home. As he walked out of the building,his economics professor slightly behind him, Jack opened the door of his brand new Chevy Malibu and noticed the economics professor getting into his own vehicle. With a shocked and confused shake of his head, Jack questioned that if someone who teaches the benefits of economics and how to get ahead in life is still driving a beat up piece of crap car, then why the heck did he need to get that degree? He figured he must be doing something right to have just afforded a brand new car! Besides, he was much too busy with work and his growing family. So with that, you guessed it, thus ended his 4-year degree pursuit early. So the decision was final and a startup injection molding company had been the business of choice. Now it was time to choose a lawyer, an accountant, a banker for a loan, a location, the rest of the needed equipment & assets, and people to help run the plant. They started with the accountant. One day, close to lunchtime, Jack went through that Yellow Page’s section from A to Z and had gotten discouraged because everyone he called was either not available or no one answered the phone; possibly because he was indeed calling around lunchtime…. Jack assumed many people were as hard working as he was and worked through lunch or ate later. Maybe not. It wasn’t until he got to the G’s that he finally got a hold of an actual accountant! Not a secretary or an assistant, a real live accountant that had authority to have a discussion about next steps and availability. The mutual connection was obvious. This man had good character, was a great family man, was incredibly intelligent in his field, and would end up becoming a very close friend to the Bertsch family (where he still remains connected to them over 38 years later and has joined the team as CFO). So now they had their accountant. He and his brother had a bank and loan officer to recommend that worked with SBA loans, so they set up the appointment. Then came the interview where both Jack & Joan were grilled – How much do you want for the loan? Why do you want it? What business are you starting? Do you have experience in running a business? Why do you think you deserve it? How much are you willing to put up for collateral? What will you do if you fail? Well, their answer to that last question was “We will not fail! Period”. With the inquisition now over, they had a newly approved small business loan, and it was also about this time that they secured an incredible lawyer who just like the accountant was a great family man, was incredibly knowledgeable in his field and became an integral part of the Bertsch family, the history of the company, and continues to this day to serve as friend, lawyer and family advisor. Once things were underway with paperwork started, Jack actually chose to hand-carry it to each business to “make things happen” and keep the balls rolling at each location. Back and forth from lawyer, to accountant, to SBA loan officer, to bank, etc. They refused to let it sit in a pile on someone’s desk because they weren’t about to lose the passionate start to securing their family’s future to some paper-pusher that couldn’t connect with their story. The persistence paid off, but there was one final piece. They needed to sit down and decide on a name. Since they’d be ‘converting polymers’ the quick and easy decision landed on “Polymer Conversions, Inc.”, that was then made official by incorporating in December of 1978. While Jack was busy “making things happen”, Joan was also busy, setting up a temporary office in the house. We’re talking the late 1970’s here as well as a really small space, so just the basics like a desk, a typewriter, a rolodex for contacts, paper files and folders were all that were needed. She started setting up folders for the things she would need to run the administrative part of the company like future HR/employee needs and a list of supplies they’d need to get once in a permanent facility. They were starting from scratch so they would need everything from bathroom supplies, to coffee and kitchen supplies, to janitorial supplies, all the way down to basic desk and office supplies. She also started setting up files on potential vendors & customers, setting up accounting ledger sheets by hand, and working with the accountant to figure out how to budget for the things they needed to run the business. She began opening up accounts and building relationships with local vendors, shipping companies and plastics suppliers so they had things all set and ready to go once they were in their facility. 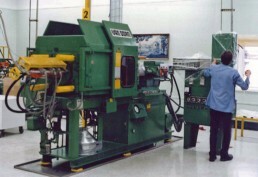 As Jack began to close the chapter on his employment with Thruway Molders/Injectronics, he still had to find guys to help him in the future plant, as well as find the location they would call their home away from home. The Buffalo plant they were in was about to close, so why not try and grab some of the close friends he had made that were also about to lose their jobs and already knew the business? So two of them plus Jack started searching for a building to rent that was close enough to everyone’s home that they could still spend ample time with their families, but that also made sense for plastic products manufacturing. It didn’t take long, then Violá! 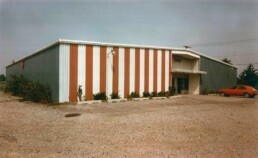 2100 Old Union Rd. in Cheektowaga, NY became the new home base. 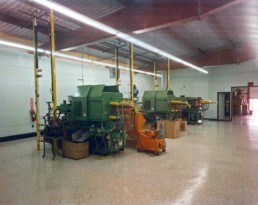 This location allowed them to rent half of a metal building that gave them 5,000 square feet, but they still had a long road ahead of them to fully clean and get the facility ready for people and equipment. And by clean, that meant “Bertsch clean”. Every square inch of the plant was washed, scrubbed & vacuumed and as clean as it could possibly be before anything was moved into the building (and as items were transferred in, they were thoroughly washed/wiped down before they were put in place). They now had their foundational base: accountant, lawyer, loan, building, the first couple employees, equipment & office furniture, and themselves. Soon, the building was full & ready for business. All they needed now was a solid purchase order from a customer! So how long do you think they had to wait for their first order? Want to know what happened next? Then stay tuned for Part 3 of our series, in next quarter’s newsletter!